Continuing with our series (part one and part two) on the role that geospatial technology plays in treasure hunting, we come to the mysterious tale of the RMS Republic. Launched in 1903, the Republic was a part of the White Star Line, and, foreshadowing its sister-ship the Titanic, it sank six years later, 50 miles south of Nantucket Island in the North Atlantic. Now the mystery: Treasure hunter Captain Martin Bayerle, who discovered the location of the Republic (shown above) in 1981 and owns salvage rights as well as title to the ship, believes the wreck holds a fabulous treasure of gold in excess of $2 billion. Although $50 to $70 million of this fortune is well-documented (US Navy payroll), Catain Bayerle’s research leads him to believe that a secret shipment of gold consigned to the Czar of Russia puts the total treasure over the $2 billion mark. 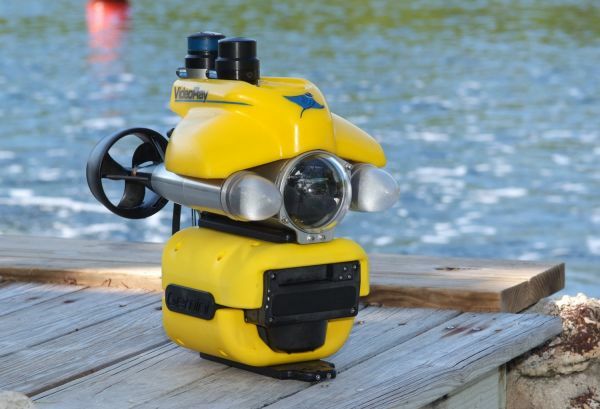 Now Captain Bayerle is back with his son Grant and equipped with state-of-the-art technology, including two ROVs—a Seaeye Falcon (shown on left) and a VideoRay UROV (shown below)—and Teledyne BlueView’s 2D Imaging Sonar. Captain Bayerle describes the Republic deep-water (250’) salvage effort as “deep, dark and dangerous,” which makes the site an ideal application for ROV tech. 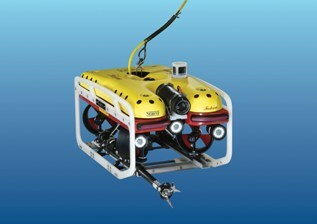 The Falcon, equipped with BlueView scanning sonar, was used to image the wreck, providing vital operational and targeting data for the salvage divers. Additionally, the Falcon’s manipulator arm was used to good effect to untangle the salvage ships’ mooring lines when they became entangled with the wreck and endangered the operation. The diminutive (50.8 x 37.3 x 14.7 cm/20 x 14.7 x 5.8 in) VideoRay’s size came into play with the team imaging tighter spaces on the wreck site. The search for the lost treasure of the Republic continues with a big assist from ROVs and scanning sonar. In the next issue of this series, I’ll look at what the possibilities hold for the next stage of treasure hunting using leading-edge geospatial technology.